The Curtiss T-32 Condor II was a 1930s American biplane airliner and bomber aircraft built by the Curtiss Aeroplane and Motor Company. It was used by the United States Army Air Corps as an executive transport. The Condor II was a 1933 two-bay biplane of mixed construction with a single fin and rudder and retractable landing gear. It was powered by two Wright Cyclone radial engines. The first aircraft was flown on 30 January 1933 and a production batch of 21 aircraft were then built. The production aircraft were fitted out as 12-passenger luxury night sleeper transports. They entered service with Eastern Air Transport and American Airways, forerunners of Eastern Air Lines and American Airlines on regular night services for the next 3 years. The Colombian Air Force opered three BT-32 equipped with floats in the Colombia-Peru War in 1933. Two modified T-32s were bought by the United States Army Air Corps (designated YC-30) for use as executive transports. One Condor was converted with extra fuel tanks and used by the 1938 Byrd Antarctic Expedition, and unique for a Condor had a fixed undercarriage to allow use on floats or skis. Some aircraft were later modified to AT-32 standard with variable-pitch propellers and improved engine nacelles. The AT-32D variant could be converted from sleeper configuration to daytime use with 15 seats. Four T-32s operating in the United Kingdom were impressed into service with the Royal Air Force at the outbreak of the World War II. Eight bomber variants (BT-32) were built with manually-operated machine gun turrets in the nose and above the rear fuselage. All these aircraft were exported. A military cargo version (CT-32) was also built for Argentina. It had a large loading door on the starboard side of the fuselage. 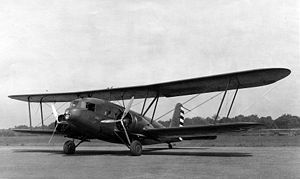 Picture - A USAAC YC-30 in 1933. Ten T-32s modified to AT-32 standard. Variant with variable-pitch propellers and 710 hp (529 kW) Wright SCR-1820-F3 Cyclone engines, three built. An AT-32 variant with 720 hp (537 kW) Wright SCR-1820-F2 Cyclone engines, three built. An AT-32 variant, one built. An AT-32 variant with 720 hp (537 kW) Wright SCR-1820-F3 Cyclone engines, one built. AT-32 variant for the United States Navy as the R4C-1, two built. Military cargo variant with large cargo door, three built. United States Army Air Corps designation for two T-32s. United States Navy designation for two AT-32Es (one for United States Marine Corps) both later to the United States Antarctic Survey. Eastern Air Transport operated T-32 variant. International Air Freight, Croydon operated four T-32s. Argentine Naval Aviation operated 3 aircraft of the CT-32 variant. Chinese Nationalist Air Force operated BT-32 variant. Colombian Air Force operated BT-32 variant. Peruvian Air Force operated BT-32 variant. Royal Air Force - Four T-32 variants impressed from International Air Freight. Not used in service and scrapped at No 30 Maintenance Unit. RAF Sealand. United States Army Air Corps operated two YC-30 aircraft. United States Marine Corps received one R4C-1 aircraft. United States Navy received one R4C-1 aircraft. On 27 July 1934, Swissair Condor CH-170 broke up in mid-air and crashed at Tuttlingen, Germany killing all 12 passengers and crew. Bowers, Peter M. Curtiss Aircraft 1907-1947. London: Putnam & CompanyLtd., 1979. ISBN 0-370-10029-8. Taylor, H.A. "The Uncompetitive Condor" AirEnthusiast Six, March-June 1978. Bromley, Kent, UK: Pilot Press Ltd., 1978. The Illustrated Encyclopedia of Aircraft (Part Work 1982-1985). Orbis Publishing, 1985.